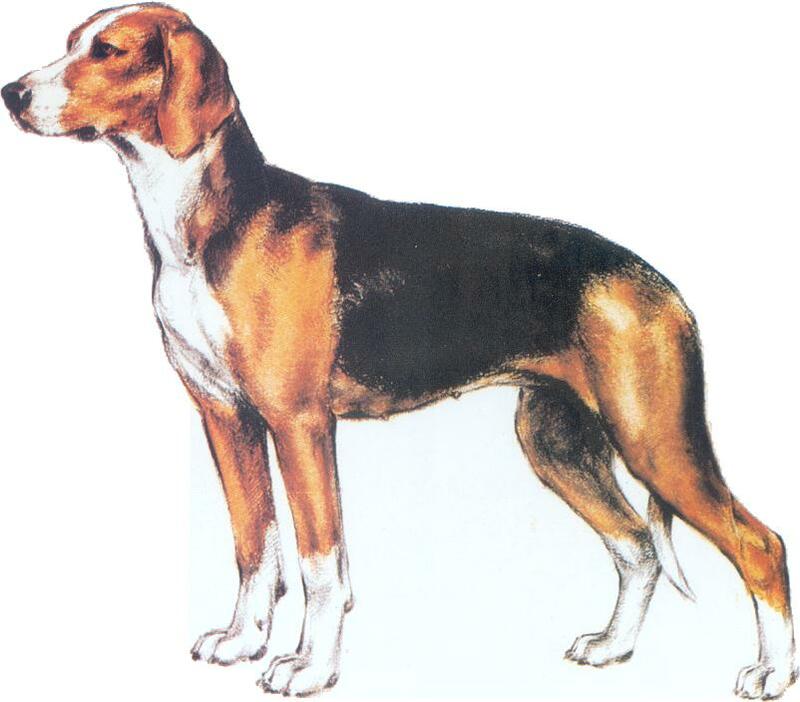 : The tricoloured scent hound has the same origins as the other Balkan scent hounds. In 1946 the theory that this breed was merely a variety of the Serbian scent hound was refuted ; it was granted breed status and a first standard was drawn up. This breed was shown to cynological circles at the Belgrade International Dog Show on June 7th and 8th 1950. The F.C.I. recognised the breed and published the standard for the tricoloured Yugoslav scent hound on July 25th 1961.
: Medium sized dog of robust constitution. Full of character, it is lively and energetic. : Devoted, kind, lively temperament ; dependable, showing remarkable tenacity. : Dolichocephalic ( narrow skull base coupled with great length ), slim ; top lines of skull and foreface are divergent. : Seen from the front and in profile slightly rounded, pronounced frontal furrow. Occipital crest not very developed. Distance between base of ears is equivalent to that between stop and occipital crest. Superciliary ridges almost imperceptible. : Cuneiform ; shorter than skull, ideal relationship between length of muzzle and that of skull is 8 .5 to 10. It tapers progressively from stop to nose. The foreface is straight. The lateral lines of the muzzle are convergent. : Thin, close-fitting, mediumly developed, quite short and rounded at the end of the muzzle. The edge of the lips should be black. Top lip slightly over1aps lower lip ; corner of lips is firm. : Jaws are strong with regular complete scissor bite. Pincer bite allowed. : Almond-shaped, almost oval, medium size. Pigment at edges of lids is dark (preferably black ). The colour of the iris is as dark as possible. : Set high, medium length, pendulous, close to cheeks, medium size, the tip of the ear is slightly oval in shape. Ears are thinner than thick. : Strong, in length approximately the same as the head. Top line is slightly arched. The neck is at an angle of 45 to 50 degrees to the horizontal plane. : Rectangular. Length is 10 % more than height at withers. : Well-muscled, straight, strong, long. : Well-muscled, length about the same as that of the croup. : Slightly sloping ( 20 -25% in relation to horizontal ), well-muscled, broad. : Strong, height 50 % of height at withers, girth 20 % greater than height at withers. : Oval point of sternum standing slightly proud. Belly has slight tuck up. : Extends line of croup. Strong at base, tapering progressively towards tip which reaches level of hock. Carried curving up slightly, never lifted above line of back. Covered in abundant hair. : Strong, straight, well-muscled, parallel. : Scapula (shoulder blade) approximately same length as upper arm, muscled, solid, well attached to thoracic wall. Forms an angle of 45- 50 degrees in relation to horizontal. : Close to body, strong, muscled, approximately same length as scapula. Forms an angle of 45-50 degrees in relation to the horizontal. : Close to body , solid, height from ground to elbow 50 % of height at withers. : Strong, slightly sloping ( up to 15 degrees from vertical ). : Cat foot, with solid tight toes. Nails are strong, preferably black. Dark pads, well-developed. : A little longer than front foot; solid tight toes ; black strong nails; pads resistant and elastic, dark in colour . : Solid, parallel with median line of body .Angle of stifle about 120 degrees. : Well-muscled, length approximately that of the thigh. : Strong, angle of hock between 135 and 140 degrees. : Long steps, energetic and stretching reach. Preferred pace free trot, regular, harmonious and even. : Elastic, well-pigmented taut over the body. : Short, abundant, gleaming, slightly thick, lying well all over all the body ; undercoat is quite well-developed. Hair is slightly longer over the back of the thighs and the underside of the tail. : The base coat is deep red or foxey red with a black mantle or saddle. The black can go up as far as the head where it forms black marks on the temples. The white star on the head and the blaze which stretches down the muzzle form a complete or partial collar under and around the neck. A white mark is allowed on the chest and may extend as far as the tip of the breast-bone and reach the belly and inside of the legs .The end of the tail can be white. White must not make up more than one third of the total body surface. Males 45 -55 cm, ideal height 51 cm. Females 44 -54 cm, ideal height 49 cm. White marks with speckling of the base coat colour . Presence of a fourth colour.